WG: I was still in Poland when I started working on Po trochu, although not in my native village but in Kraków. I had toyed with the idea of moving back to my parental home for the summer and writing the book there, but soon gave up on that. Intuitively I knew that I needed some distance. I started writing the book in Kraków and finished it even further from home, in Bratislava. Some books may not require this kind of distance but to write a book that is so profoundly rooted in your childhood, in things you carry deep inside you, you need to disconnect. You have to be like an atom that has split off from the mass. I think the distance was good for my writing. JS: How does living in a different linguistic environment affect your own writing? Does the distance sharpen your perception of your native language, make you more sensitive to its cadences and nuances, or do you sometimes feel you are losing your grip on Polish, particularly as Slovak and Ukrainian are quite close to Polish in many ways? As you write or translate, do you ever have to struggle with linguistic interference? WG: The multilingual context, this kind of schizophrenia, has had a major effect on my writing, particularly since Polish and Slovak, as well as Czech, are closely related languages. When I watch English-language films with Czech subtitles, my mind automatically starts to analyse—so this is how it’s handled in one language, and this is how they do it in another. This interference is something I grapple with on a daily basis. My editors have noticed that I sometimes use Slovak words or sentence constructions. But does this mean my Polish is losing something or is it actually gaining? It’s hard to tell. Some words that have an archaic ring in Slovak are quite common in contemporary Polish and vice versa. I like playing with this. Overall, I believe that multilingualism is an added value. But unless you grow up multilingual—which is not my case—your brain’s capacity is quite limited. So, sadly, the better my Slovak gets the more it supplants my Ukrainian. I am very envious of people who grow up with two languages, it’s a great gift. Each culture and language invents different ways of depicting the world. And the more of these systems you are familiar with, the more open you are to the world. Galicia, the part of Poland I come from, used to be a part of the Austro-Hungarian empire. People in the cities spoke German, Yiddish, Polish—all these languages permeated one another. One of the most significant Ukrainian-Galician authors, Ivan Franko, wrote in some five languages. And it wasn’t a problem for him. But this is not to say that it was an ideal world—I come from a peasant family, my great-grandmother didn’t even complete primary education. But that’s another story, I’ve digressed too much. JS: There are authors who continue to write in their native language while living abroad: for example, Witold Gombrowicz, and more recently, Wioletta Grzegorzewska who lives in the UK, or Ivana Dobrakovová, a Slovak writer based in Italy who writes in Slovak and also translates from Italian and French. On the other hand, some writers abandon their native language and successfully adopt the language of their host country, most famously, Joseph Conrad or Vladimir Nabokov or, to take a recent example, Alexandra Salmela, a Slovak who writes in Finnish. As you now live in Slovakia and are completely fluent in Slovak, do you see yourself switching to writing in this language at some stage? WG: Not really. I may be fluent, but my Slovak is good only on an everyday level, enough to live here and interact with people, whereas literature requires a level of abstract thinking. My Slovak isn’t up to creative work, such as writing, but I’ve only lived here for three years and things may change in ten or twenty years. For the time being, I connect writing with Polish. Sometimes I think or dream in Slovak, sometimes in Polish – it’s fluid, it’s not under my control. But writing is a process I have to keep under control and that’s why I choose Polish. It gives me a solid foundation, it’s a space I know through and through. I don’t yet feel so confident in Slovak. JS: Writer and translator Lydia Davis said (in an interview with Los Angeles Review of Books): “I enjoy translating these foreign texts into my beloved English. I enjoy that aspect of translation—that it is a form of writing that doesn’t involve the invention of the piece of writing. […] Translation is both a form of writing and a puzzle to be solved.” How do you approach these two different kinds of creative processes, writing and translating, and what do each of them mean for you? WG: Translators need to have a creative imagination. You have to get as close to the author as possible to be faithful, to forget yourself; you have to turn into a lightning conductor. And that is incredibly difficult. In technical translation all you need is a good dictionary, you substitute one term for another, but in literary translation you have to mobilise your intuition, all your knowledge, cultural codes. You have to be well-versed in the cultural context, which is all-important. Translating is a kind of decoding, and I love that. The puzzle metaphor is also apt. Writing and translating are two very different processes. With translation you already have the material to work with. With writing, you first have to generate something, and then modify it. For me writing a first draft is an arduous process, which I don’t particularly enjoy. In this respect, translation would seem, at first sight, to be less demanding. But that’s deceptive: you constantly have to be on your guard, tame your own demons and ambitions, forget yourself, turn into litmus paper. Translation gives me, as a writer, something incredibly important: it teaches me humility. We all know that writers tend to have a problem with humility, we are egocentric by nature. JS: In her wonderful memoir, Translation as Transhumance, French translator Mireille Gansel defines translation as “a hand reaching from one shore to another where there is no bridge”. One might think that since Poland, Slovakia and Ukraine share borders their peoples ought to be familiar with each other’s cultures. But in fact, people are quite ignorant about the literature of the neighbouring countries, perhaps because they all look further out, towards “bigger” cultures, so there is quite an urgent need for this kind of bridge-building. Do you see this as part of your role? WG: I do, absolutely. It might sound banal, but I do feel this precisely because we keep building walls instead of bridges. How long has Europe managed without continent-wide military conflict—50 years following World War II it seemed that we would live in peace forever after. But we’re not capable of that. For the past few years a war has been raging in Ukraine, European countries are isolating themselves, they don’t know how to deal with immigrants, they only look after their own interests. This emphasis on individualism, all this ‘me, me, me’, might destroy us, if it hasn’t destroyed us already. We lurch from one extreme to the other. For me, individualism is an important value, but community is equally important. One doesn’t exclude the other. But there can be no symbiotic relationship between individualism and the community spirit without a key factor: respect. Both for oneself and for the other. This lack of respect, the fear of otherness that has been artificially fanned in society, stems from ignorance, from not knowing the other and an unwillingness to encounter and get to know the other. Literature, film, theatre are great platforms for dialogue and translators play an invaluable role here. I try to share my multicultural experience as much as I can, but it’s not enough. Because consumers of culture are limited to a small group of people, it’s a bubble of which I am also a part. The average Pole doesn’t read Polish books so why should he or she be interested in Slovak ones? That means we have to continue our painstaking work. The more platforms for cultural exchanges there are the better. Who knows, maybe one day we can all meet and share our neighbourly experiences in a real cultural Agora. JS: How do you go about choosing the authors you translate? Do you prefer contemporary writers or classics? Which authors have you translated so far and what translation are you working on at the moment? WG: I don’t have that much to boast about, having only three book translations from the Slovak under my belt. I am fortunate to have worked with authors who are close to my heart, to the way I see the world, which made translating their work easier. We have since become friends. They are Ján Púček (Uchom ihly/Przez ucho igielne/Through the Needle’s Eye) and Maroš Krajňak (Informácia /Informacja/Information and Carpathia/Carpathia), both authors for whom memory, identity and the process of forgetting play an important role—themes I also find fascinating. It makes a huge difference if a translator is in tune with a particular author. I have never translated genre literature, crime or romantic fiction, and would be happy to take on the challenge. Right now I’m working on a book by Yuri Izdryk, a cult Ukrainian author who is regarded as a modern classic. I’m just doing it ‘for the drawer’, we’ll see what, if anything, comes of it. JS: Who are your favourite Slovak and Ukrainian writers and whom would you recommend to English-language readers? WG: To understand the cultural context, I recommend books by Marina Lewycka, a British writer of Ukrainian descent, who could be seen as a kind of ‘bridge’. And any book by Oksana Zabuzhko, including her essays. But my favourite Ukrainian writer has always been Taras Prochasko: reading him you will learn a little bit about us, people of the Carpathians. I also recommend an extraordinary picture book for children about the current war in the Ukraine, The War that Changed Rondo. Its authors and artists, Romana Romanishin and Andrij Lesiv, have designed the cover for my book, for which I am immensely grateful. As for Slovak authors, apart from those I have translated, I recommend Marek Vadas’s magic realist stories inspired by his African journeys. Also Rudolf Sloboda, whose books have yet to be translated into English, as well as two writers whose works have appeared in English translation—Balla (“The Chair”, In the Name of the Father) and Pavel Vilikovský (Evergreen is… and Fleeting Snow). I very much hope that some niche English-language publisher will focus on Central and Eastern Europe. We have lots of interesting things to say. JS: To come back to your own writing, how do you explain the emergence of several wonderfully evocative, powerful books depicting the experience of growing up in a Polish village? Apart from your own book, there has been Wioletta Grzegorzewska’s Guguły (Swallowing Mercury in Eliza Marciniak’s English translation) or Maciej Plaza’s Skoruń. Do you see yourself as a part of a wave? WG: Yes, I do see myself as a part of this wave. You see, Poland carries this huge burden of monolithic narration. It’s to do with our history, the fact that for 123 years my country was erased from the map of Europe. Past narratives emphasized the existence of Poland as a unified whole, which—even if it’s not quite true—made sense in the past. But we’ve had enough of it and perhaps this is why micro-worlds, small motherlands, narratives from the periphery, are making themselves heard. Besides, the periphery is the most interesting place for an author to depict, it is where clashes and confrontations occur, where worlds permeate one another. For me, the world seen as a huge construct is deprived of its core, its soul. That is why I welcome this trend in literature. May it continue for a long time! After all, our world consists of atoms, right? For some reason, I keep coming back to atoms, but it is a fitting metaphor. I believe we should look at every crumb, every little grain of sand individually and then assemble a whole out of them. JS: The Conrad Prize aims to support writers working on their second book. Have you started working on something new? What will it be? WG: Right now, I’m working on two new books. Both will tell stories about Slovakia, but in different ways. I want to try my hand at two different genres: a collection of reportages and a collection of short stories. I am looking for various perspectives, hoping that I will be able to capture what I love most about Slovakia. Because my love for this country is still strong after three years. I hope it will stay that way. WERONIKA GOGOLA was born in 1988 in Nowy Sącz in southern Poland and grew up in Olszyny, the village that features in her prose debut, Po trochu. She graduated in Ukrainian Studies from the Jagiellonian University in Krakow and works as a translator from the Slovak and Ukrainian. Po trochu received the Conrad Award, and was nominated for the NIKE Literary Award, Angelus Central European Literature Award, and Gryfia National Literary Award for a Female Author. JULIA SHERWOOD was born and grew up in Bratislava, Czechoslovakia. 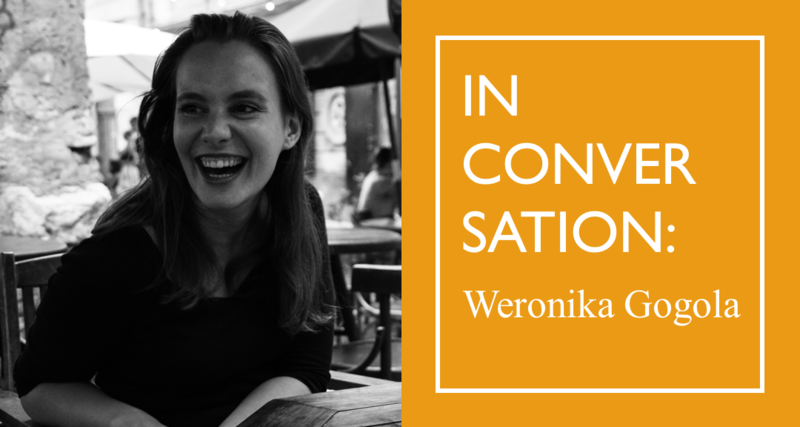 Since 2008 she has been working as a freelance translator of fiction and non-fiction from Slovak, Czech, Polish, German and Russian. She is based in London and is Asymptote’s editor-at-large for Slovakia.